The story is good, but not great. I always thought it was hard to make new friends. But making enemies. I guess that’s easy. We got four problems. We saw their faces, we know their names, know what they’re capable of. They’ll find us again – they’ll find you and finish the job. Unless you find them first. You always have a plan – and now – you have something more. 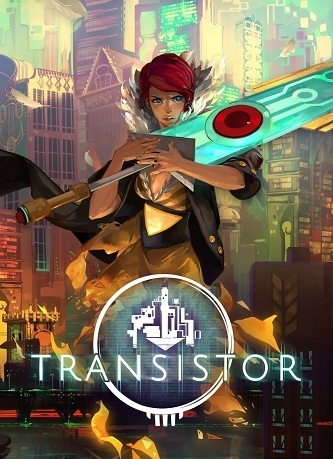 Between the words Transistor says and the imagery in the background, it subtly sets up a different type of story. The typical kind of story where there is an overarching villainous leader and then three ranked lieutenants, an elite four3, if you will. You would defeat each one in progression and eventually, make your way up to the top figure, the true leader, and have one last grandiose battle. That’s what I expected from the launch trailer. But that is not the entire story. Or, really, any of the story, pretty much at all. Without spoiling Transistor’s actual story line, it begins like this: you return to the scene of the crime and a single Camerata (the name used to describe this elite four) happens to appear before you. You might expect some lead up to this, or maybe some on-the-scene dialogue, but no. The fight begins. Instead of Sybil, the Camerata you are to fight first, seething in anger at something you did, did not do, or being obviously evil and insidious, she appears to fight you only because she is possessed by the Process and effectively has no control anymore, not because she is a crazy monster wielding megalomaniac – oh wait, that is exactly what she became (I guess). Whatever the case, the traditional story would have moved to the next lieutenant until meeting the final boss, the final Camerata kingpin, Grant. (You know the man too. He’s the really obvious important Camerata, broad shoulders, beard of wisdom and literally portrayed in the launch trailer as bigger and further back than all the other Camerata.) Moving from villain to villain, or at least, Camerata to Camerata would have given enough time to build up the nature of the organization, their place in the world, their histories, perhaps motives, and their actual personalities. But no. The story progresses: you do not end up ever actually defeating all four Camerata in the typical climb to the top. So why is that a big deal? It is fine to bait-and-switch in a trailer, especially when used to surprise the audience. While Transistor the Sword might have known the Camerata – Sybil, Grant, Asher and Royce, as a player, I never really met them and never understood their natures. Clearly, Transistor was a man who loved Red – that is a great reason for him to bare some malice against the Camerata but as a player, I fail to feel it. If we actually had dialogue with each of the Camerata, before and-or after the initial events, it would feel more justified that their actions were either malevolent or benevolent. Who does talk to you? Transistor, the mysterious and unnamed person trapped inside the sword. He’s similar to you though, unfortunately – he missing information. He cannot tell you the player everything you need to know about what is going on and why. That is fine too, because he is right along side the character you are controlling, Red. His lack of knowledge is an integral part of the story. Transistor, though, is the best characterized entity in the game because he actually speaks, and he speaks a lot. Transistor offers to share memories while reminiscing at various locations in game, he has various levels of enthusiasm, he accepts his fate as a sword eventually, he is the voice of reason, and even the voice of pleading. His remarks throughout the game are the best. Asher and Royce speak to you, but their messages are broken apart. No, literally, they are separated among a series of in-game computer terminals you access, you get a 15-30 second audio clip of them speaking ambiguous nonsense and maybe a hint every now and then, but nothing of value. Royce is a little better – he is not as delirious as Asher, but his voice and speech pattern might drive you up a wall. Three characters speak in Transistor, the game. Between making the story less grokkable and the characters less developed and personable, this simple fact limits the impact of the story and the characters4. Moving on, let’s talk about the lore delivery. The world of Transistor is full of homages to computer terms. It is risky for me to say computer science terms because of the ambiguous ways the fictional story alters the normal meanings of words and weaves a fun game out of them, so I will avoid that pitfall. Instead, if you know computer science or are just a technology enthusiast, you will enjoy the game’s diverse set of technical clad lore in-jokes. Cloudbank is a joke on the idea of the Cloud and Memory Banks, probably. Transistor, the sword itself, is a joke on transistors. The Process (the natural enemy in the game) has a lot of meanings, but it is a pun on either Node Processing (i.e. the Process) or the general idea of a computer’s Process. To understand the Process with another popular game entity, think of Halo’s flood. When battling with the Process, you use abilities called functions, which derives from programming small reusable chunks of code, and the names of the in-game functions often allude to some aspect of computing such as: a crash, a breach, a get, a flood, and so on. But for all that is good, there is bad too. The bulk of the game’s lore delivery comes in the form of voiceless terminals where Transistor will comment on contents of that terminal’s news, and then Red has the option to write a message Transistor can read or respond to the terminal with. The contents of most of the early terminals are basically news clips brought to you by your favorite reporter and the news is about the events unfolding in the city around you. The question, is, where are the people actually listening to this breaking news – because as far as you can tell, nobody actually lives anywhere in Cloudbank except maybe sixteen people. Maybe. And they’re all sort of dead. You might say they were integrated into the Process, but telling or showing me that is too much, I just get to guess instead. If that was not enough, the lore elements are fairly static – nothing changes depending on interactions with one terminal and then another, or not with a certain terminal, and another. If you play Transistor in a certain way, you will be able order to order a pizza via a terminal, but if you do not walk up to that terminal and order the pizza, you will eventually find that the pizza was still delivered anyway despite never ordering it. Sea Monster is always the clear choice, for some reason. The game was telling me the lore, not showing me the lore. This is most likely where Transistor shines. There are merely sixteen abilities in the game available for combat. Turn() allows you to enter a special planning mode, which is like a turn-based strategy game – you pick from a skill bar of four functions, place AoE circles on the map, teleport (or walk) around enemies, align ranged attacks, and then when ready – let the game return to real time and all of those scheduled functions will be executed rapidly to the best of their ability. Otherwise while outside of Turn() mode, you can use your skill bar functions anytime you like to use Transistor the Sword and his broad range of unique abilities. Furthermore, these abilities have effects, combos, alterations, modifications and pretty insane depth for building great ways to play. All of these attributes of gameplay revolve around abilities you unlock through finding in game and leveling up. Your skill bar is merely four abilities out of sixteen total, but you can augment them over time (especially in New+ mode) through unlocking more abilities, upgrade and passive slots. If you are so pro at this game, you can also enable Limiters. Why build in a set level of difficulty when you can make your players pick instead? Well, I agree – that is what a Limiter is: you can enable up to ten different Limiters which change the mechanics of the game. For example, you might lose one of the slots on your skill bar or when you enter a battle with a Process, more enemies might spawn more than normal. Using Limiters provides an XP bonus percentage of the XP you normally earn. If you earned 10% of your next level, you would end up earning 4% extra with two Limiters turned on, for example. This eases the grind to level up to unlock abilities and modification slots faster while still increasing the base difficulty. Oh, wait, what grind? You are perfectly able to play the first run through without a grind. I made it to level 10 in the first play through without Limiters and I had no sadness I did not have every single slot unlocked. Leveling up is quicker after New+ mode simply because you can win faster, but even in the first run, nothing is really stopping you. After beating the game you can get the New+ mode which is kind of great. You get to keep all your earned functions and other obtained advantages, but the Process also will have some new tricks up their sleeve. It is worth it though, because there’s nothing like steamrolling a YoungLady effortlessly. There are a few more mechanics too. Your skill bar might be only four functions deep, but each function has two upgrade slots so that other functions can augment that primary ability with yet more abilities. The way functions are metered is out using a cleverly named memory currency; initially you have a limited amount of memory and through leveling up, you can expand your memory from 8 to 32, and functions each cost between 1 and 4 memory each. You earn additional memory every few level-ups. If you are in a combat situation and your health bar is drops to zero, you will trigger an extra Turn(). If you still take more damage after that, instead of returning you to a game over screen, the game will just take away one of your functions. It is shame when it is the function you love, but that is the price you pay. I never lost any fight, though I came close, but presumably losing all four functions would cause the game over screen to appear and redirect you to the last save point. The punishment for experimenting in the game, and also just not being great at this kind of game, is relatively trivial. One more thing: puzzles. There really are none, even though you might feel like there should have been, especially if you played the game for about six minutes and made it to the room where you needed use Turn() to trigger a door to open by using Crash() on two ground nodes, which is only possible by using Turn() effectively. It is easy to speculate that somewhere along the game building process, puzzles were going to be a thing in Transistor, and then for some reason, they were taken out. It is simultaneously a shame and a relief5. As I mentioned in the beginning, I completed the game pretty fast. In a day. And before you ask, “did you read every terminal and play through all of the Backdoor content”, the answer is, yes and definitely no way. I read every terminal I could find in the original and second play through while glossing over most in the third. The Backdoor world offers you a variety of challenges to prove your skills and a bulk of annoying steam achievements can be earned there, but that is not the story. That is a sideshow. The story is short. There’s no escaping that. Sorry. Buying Transistor and the album may or may not make sense for you. If you need some strange ringtones and really love the headlining song, then by all means buy the album. You can find pretty much everything through YouTube, Spotify, and other sources if you look hard enough. The music great in game too, without vocals. There are the straight album tracks, but there are also processed versions where there is distortion. The first noticeable place where this occurs is the battle with Sybil in the first arc. It is a shame that Ashley Barrett does not sing in more than just a few of the tracks in the album. Her voice is great and the background music is great too. Trip-hop, jazz-hop, whatever this is, it is incredibly great. It reminds me a lot of my infatuation with the Ghost in the Shell (SAC) OST, something along the lines of I Can’t Be Cool. I have this intense tendency to grind on a particular song for about a week, where every moment spent in studio while not recording is listening to the same track on repeat. We All Become is just that good6. Supporting music you love is great, so if you can, buy it. If not, enjoy it anyway at your local YouTube. Ha. What were you expecting. Actual multiplayer? Sorry, this is not Journey. Actually, Transistor does have pseudo-multiplayer, but you probably missed it7. If you have ever seen a ghostly Red running around, you might have thought it was the game leading you, but it was actually the path another player took in their version of the game. Oh, and at the terminals, you can sometimes take a poll, like who might win next week’s contest or if it should be sunny or cloudy; the results of those polls are not random – they are determined by the votes of all the players. It is not overt multiplayer. It would be interesting to fight a clone of Red, maybe being controlled by Ian with my array of clever functions, but it would feel odd in the tone of the rest of the game, I suppose. So maybe we are talking about Journey. Maybe. So with all these things. Multiplayer; .99/1; clever use of the Internet, why make fake polls when real polls work, and you know how to lead new players around? Let the older players do it for you! In traditional Eight Bit style, it is wise to use the how much would you pay scheme. See you in the country9.